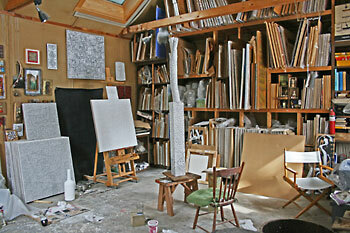 Katz's studio in North Bennington is piled high and many canvases deep with his work. A tree branch of poetry in progress is on a work stand in the center of this view. September and October's featured artist at the Dianich is Paul Katz, a resident of North Bennington who often spends his Saturdays visiting Brattleboro galleries and bookstores for inspiration. Katz, who has worked as a museum photographer and an art dealer in the past, has been painting since 1962. He has been working at his art full-time since 1989 and began introducing the words of poems into his paintings in 1993, inspired by some ancient plaques in Gubbio, Italy. "They were inscribed in Latin and ancient Tuscan, and although I could not read them, I was struck by their beauty and the elegiac mood they evoked.... I began making three-dimensional, poem-covered objects more recently as a way of extending my feeling for art as surface; as a way of covering with painted marks that both obscures and reveals the underlying form." His Brattleboro exhibit is as eclectic as Paul, a gathering of canvases and board and found objects, each painstakingly covered with the text of poetry that has moved him to render it, word by careful word, in a new dimension of expression. These pieces are a retrospective of Katz's work with poetry over the past 17 years. Although there are some presentations that can easily be followed by the reader, there are other cases in which the string of text is craftily arranged -- strong powers of observation and a determined, sleuthful spirit are a must! 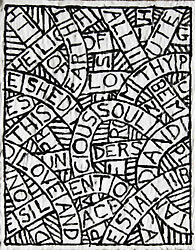 Or one can simply appreciate the wonder of Katz's creativity and meditate on the text's born-again essence. As a calligrapher and graphic designer, I find this form of working with words both exciting and refreshing. I recommend that fans of both art and literature wend their way to the Dianich to see it for themselves. If you cannot make it during the artist's reception on Gallery Walk, 5:30 to 8 pm, then call for an appointment later in the month, 802-254-9076 ext 2. If you get hooked on Katz's art and wish to see more of it (I do! ), and especially if you have a passion for both art and literature, then consider a day-trip to the Albany International Airport, not far over the state line from Bennington. 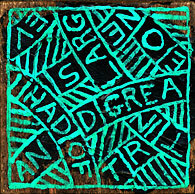 He and ten other artists are featured in an exhibit entitled "The Imaged Word," running through January 9, 2011. Paul's contribution to the widely diverse work on display includes dozens of canvases, tree branches, bottles, and ceramic figurines on which he has painted the lines of Wordsworth's epic poem "The Prelude." See www.albanyairport.com/exhibitions.php for a good taste of the treat in store when you arrive.